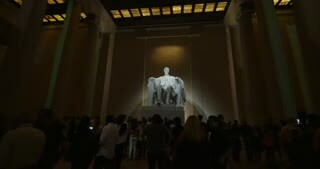 WASHINGTON, D.C. - Circa July, 2015 - A nighttime interior establishing shot of the Lincoln Memorial as tourists view the statue of a sitting Abraham Lincoln. WASHINGTON, D.C. - Circa July, 2015 - An interior establishing shot of the Lincoln Memorial as tourists view the statue of a sitting Abraham Lincoln. 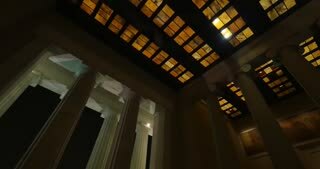 WASHINGTON, D.C. - Circa July, 2015 - A low angle fast-motion time lapse establishing shot of the Lincoln Memorial in the morning. WASHINGTON, D.C. - Circa July, 2015 - A pan right establishing shot of the Lincoln Memorial at dusk. 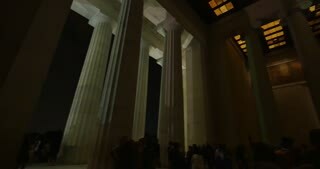 WASHINGTON, D.C. - Circa July, 2015 - A fast-motion time lapse establishing shot of the Lincoln Memorial at dusk.